Induction is generally administered because it is assumed that it is safer for the baby to be outside of the body than inside the body for various reasons including the baby being overdue, premature rupture of membranes (waters break early), weight of baby, gestational diabetes, high blood pressure or preeclampsia or other medical conditions as well as issues with the placenta and a few other reasons. It is also administered electively by women who choose to have it once they have reached term. 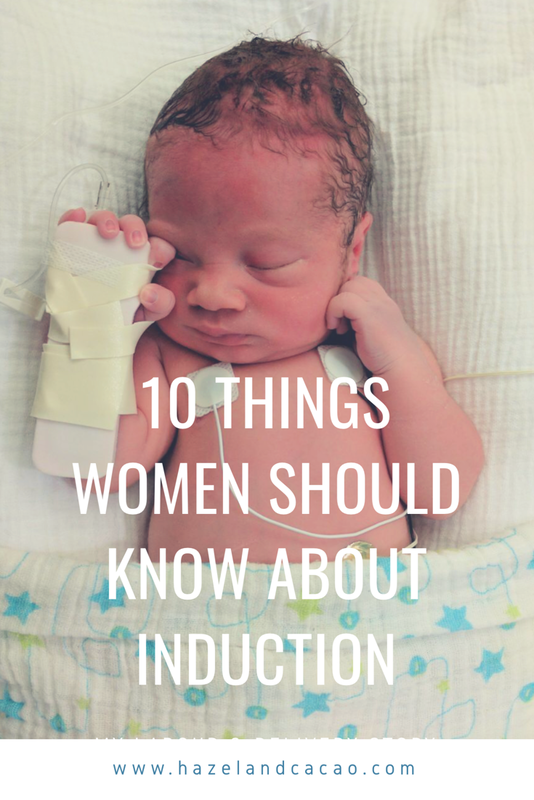 Most women would agree that the risks of NOT being induced are very strongly communicated, but what is hardly ever discussed is the actual risk associated with induction for both mother and baby. Most women are aware that induction of labour is a lot more painful than natural spontaneous labour and are also aware that the need for an epidural during induction is much higher. Beyond that, very few women know what else they can expect with induction. Induction has a relatively high failure rate. 25% of women do not take to induction and will often have a c section if induction fails. Common side effects of oxytocin in the mother include headaches, nausea, and vomiting. Seizures can also occur in the fetus and induction has lead to fetal death. Induction increases the risk of postpartum hemorrhage. Side effects of prostaglandin gel include vaginal pain, increased bleeding of uterus, nausea, vomiting, diarrhea, difficulty breathing, coughing and wheezing and blue lips. oxytocin or a prostaglandin has been known to cause abnormal or excessive contractions, which can diminish the baby’s oxygen supply and lower baby’s heart rate. It is also associated with other heart arrhythmias and termed fetal distress which is considered an emergency and leads to a cesarean section. Due to the potential side effects mentioned above Increased monitoring is required with an induction which means less mobility for the mother during labour and an increased chance of needing epidural anesthesia. Many women feel unprepared for the intense monitoring during an induction birth. As with all pharmaceutical drugs the severity of side effects are always downplayed and so it is likely that women will be convinced that the risk of these side effects occurring is very low. On the contrary, the risks of not being induced are often greatly exaggerated (as with my labour where I only carried a 1-2% chance of infection for my waters breaking early) but women are generally not informed of the statistics at all. I do not want to scare anyone away from induction, it is true that complications following induction are rare and severe complications are unlikely. This may be because of increased monitorisation during an induction where medical staff will intervene (often with a c section) if any of these side effects occur. Personally, I fought very hard not to be induced because I know that my body cannot tolerate medication. I react very violently to most medications, including many natural supplements. I know without a doubt that my induction would have resulted in seizures (I’ve reacted with seizures to artificial hormones before) and a c section. I also believe that for the most part, our bodies are much better at determining the best time for birth. Of course, there are times when intervention is absolutely necessary. However, there is a lot of controversy over what “necessary” actually is even within the medical industry itself. Due to the current nature of medical practice women are made to believe that they have no choice but to be induced. There is always a choice. Unfortunately, the choice not to be induced comes at the cost of being shamed by medical staff as well as family and friends. I know many women are happy with their induction experience and so I am glad that this option exists for women that choose it or really need it. However more commonly women are left feeling disempowered and violated at the way their both was handled. Of my personal friends that have undergone an induction, all have regretted it. During my labour when my waters broke early , I told one of the midwives “I just don’t want them to force me to be induced ” she looked at me and told me “no one is allowed to force you to be induced, it is illegal and considered an act of abuse” although the pressure from the doctors didn’t stop, it did give me courage that my choice would ultimately be respected and it was. I’ve added the reference to the study review I mentioned above as well as links to a couple of articles written by Sarah Wickham, a midwife and best selling author. These articles were highly beneficial for me so I hope they can help you too.